Robinson Plumbing Inc. has been installing, testing and servicing fire sprinkler and plumbing systems for over 35 years. As a leader in residential fire sprinkler systems, we have been at the cutting edge of new technologies such as plastic piping, concealed sprinkler heads and flow-through systems. You can trust us to offer both high quality and competitive prices. Our service areas includes all of Snohomish, King and Skagit Counties, as well as selcted parts of Whatcom, Island and San Juan Counties. 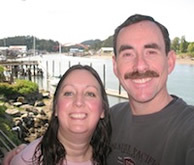 Owners Gina and Ken Robinson-Elmslie are both Washington State licensed fire sprinkler designers with more than 30 years experience between them. As second generation owners of Robinson Plumbing, they have experienced the ups and downs of contracting while maintaining a stable and healthy company.